I also have bad news for you: Your children may be damaged by your divorce, but that will be entirely up to how you do it. 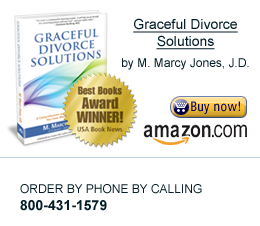 Some people divorce in such a way that is detrimental to the well-being and emotional development of their children and some divorce in such a way that is not detrimental to their children. Get along with the other parent as much as possible. This means making a true effort to support the other parent in his or her relationship with the children and to be cooperative as needed for the sake of the children. When conflicts do arise, keep the children out of them. They don’t need to know the details of your situation. They don’t need to know about other relationships, or money, or who did what to whom. What they need to know for sure is that both of you are there for them 100 percent, despite what’s going on around them. Of course they will be sad about the divorce, but keeping them out of the fray will protect them psychologically and emotionally. So, it’s that easy . . . and it’s that hard. Anyone who’s been in the thick of a divorce knows how hard it can be to keep your emotions in check at times. But it can be done, and here’s how: Do everything in your power to avoid high conflict between you and your spouse, angry outbursts in front of your children, and taking positions and engaging in power struggles with your spouse. Instead, do everything in your power to remind yourself (as often as necessary) that your children need you and your spouse to work together to make decisions that are good for them. Second, putting their needs ahead of yours at a time when you are likely to be in your own difficult place of emotional hurt, pain, fear, or anger. While you and your spouse may be ending your marital relationship, you are not ending your parental relationship, and how you end the marital relationship will directly affect the quality of your parental relationship after you are divorced. Bottom line? The better your parental relationship, meaning your ability to communicate effectively and respectfully with the other parent, the better your children will do. And isn’t that really your heart’s desire? To protect your children as much as possible through this challenging time? Well, it can be done, and it is being done. Take some deep breaths and do this for your children.